Fall is a great time to teach young students about the changing seasons and the science of leaves. As we watch the green leaves turn to various shades of orange, red, and yellow, your students are likely curious about how and why leaves change color. And, it’s still warm enough that you can spend time outside on a nature walk without having to worry about hats and mittens. 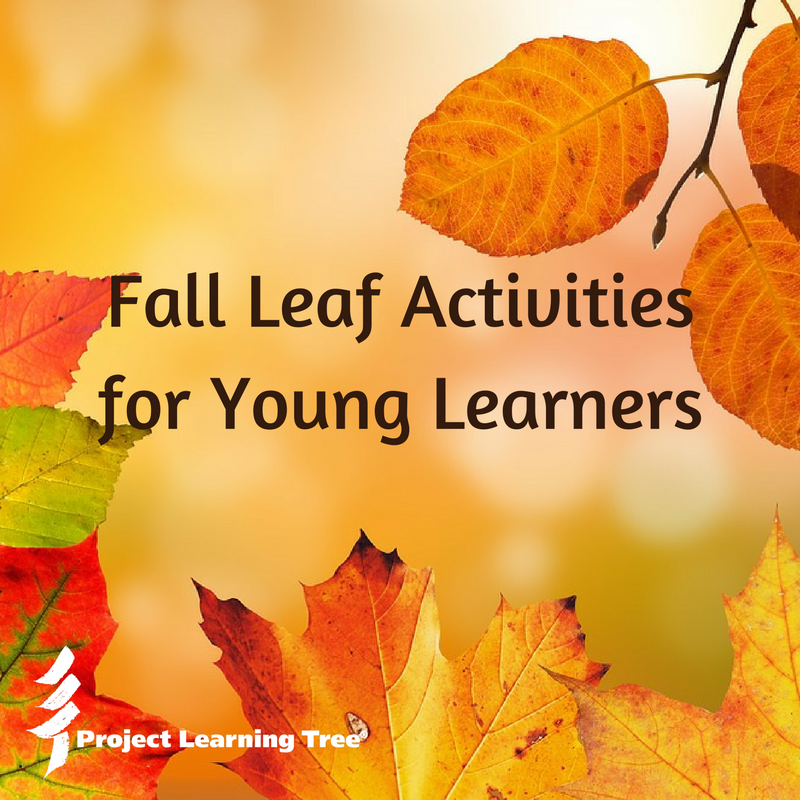 To help you get started creating a lesson plan related to leaves, we’ve compiled over 50 ideas and activities appropriate for preschool through 2nd grade. We’ve taken a multi-disciplinary approach to this topic – incorporating activities for science, math, art, and literature to engage students in many levels of learning. In addition to the ideas listed below, don’t forget to incorporate PLT’s Signs of Fall activity into your lesson plan. Also, see the full list of leaf-related activities and check out more ideas on our Pinterest page. This is a fun component of any lesson plan related to leaves. Students will enjoy being out in nature and using what they’ve collected in other science activities and art projects. After a scavenger hunt, sorting the leaves and other items collected from trees can help students learn about the different kinds of trees and different parts of a tree. There are many ways to help students learn how to identify trees by their leaves. Use the free app LeafSnap (for iPhone and iPad) to incorporate technology into your classroom. Or, try other sorting methods to help students identify trees by their leaves. This is a simple way to incorporate math concepts into a lesson about leaves. Incorporate leaves into your fall math lesson on counting or addition and subtraction. Use cards or a coloring activity to teach about the parts of leaves. Once students understand the different parts of leaves, they can also learn how a leaf breathes with this simple science activity. This simple science activity shows how leaves get their water. This activity is often done with celery to show how water travels through plants, but you can also do it with leaves! This science activity shows the different colors contained in a leaf. This activity can help show the effect of sunlight on leaves. If you’ve collected a lot of leaves from a scavenger hunt, you can incorporate them into your next art project. Let kids use their creative side to create fun people and animals from the leaves and other nature items they’ve collected. Have your students incorporate a little bit of themselves in their art. These nature prints could be used as coasters, decorative pieces, ornaments, or stamps. Fall colors make these sun catchers stand out. Paint the leaves first and use them as stamps, or paint the outside of the leaves so you see their silhouettes. This is a no-mess art project! This is a different way to take advantage of all the different colors of fall leaves and use them in an art project. You can use acorns, twigs, small pinecones, and other objects you’ve collected in your nature walk for this fall sensory bottle – it doesn’t have to just be leaves! Create a unique mason jar that show off the colors of fall leaves. This activity is probably better suited for older students because it requires the use of Mod Podge. Leaf threading helps kids develop fine motor skills. Use the threads as garland to decorate your classroom for fall! This is another fun fall art project using leaves as inspiration. Poems are a fun way to introduce the topic of leaves and the changing seasons. There are many children’s book on the subject of leaves – these are just a few. See more books about leaves on our Pinterest page. Leaves and trees can also be inspiration for learning about categories of words. See more activity ideas related to leaves on our Pinterest page. My PK4 class will enjoy participating in so many of these activities and these lessons will incorporate so much of my curriculum too! Spring is here! Flowers are beginning to bloom and new leaves are growing on the trees. Have your students take a closer look at trees to identify where leaves come from and how changing conditions affect leaf growth.